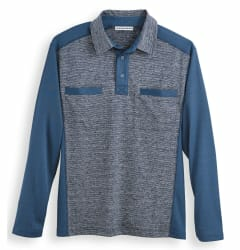 Blair continues to offer the Irvine Park Men's Wrinkle-Resistant Long-Sleeve Oxford Shirt in several colors (Multi Tattersail pictured) for $11.97. Plus, coupon code "BGAC" bags free shipping. That's tied with last week's mention, a combined savings of up to $33, and the best price we could find. It's available in select regular and tall sizes from 15.5 to 20.5. 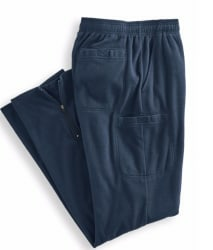 Blair offers the Scandia Woods Men's Microfleece Cargo Pants in several colors (Classic Navy pictured) for $13.19. Coupon code "BGAC" bags free shipping. That's a savings of $16 altogether. They're available in sizes S to XL. Note: They're available in XXL and 3XL for $16.79 with free shipping via the same coupon code. 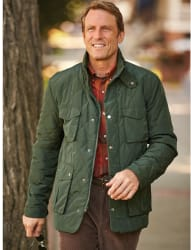 Blair offers the Scandia Woods Men's Quilted Parka in several colors (Dark Olive pictured) for $23.99. Plus, coupon code "BGAC" bags free shipping. That's a savings of $46 altogether. It's available in select sizes from S to XL. Note: XXL and 3XL options cost $29.59. 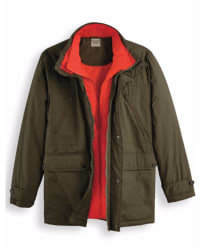 Blair offers the Scandia Woods Men's Expedition Parka in Olive or Black for $27.99. Coupon code "BGAC" bags free shipping. That's a savings of $52 altogether. It's available in sizes S to XL. Note: It's available in larger sizes XXL to 3XL for $34.39 with free shipping via the same coupon code. 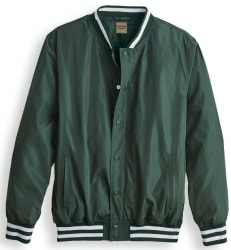 Blair offers the Scandia Woods Men's Varsity Jacket in several colors (Green Gables pictured) for $9.99. Plus, coupon code "BGAC" bags free shipping. Altogether, that's a savings of $37 and the lowest price we could find. It's available in sizes S to XL. Note: Sizes XXL and 3XL cost $12.49. 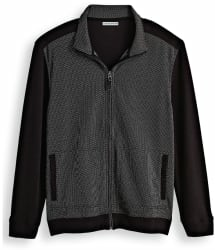 Blair offers the Irvine Park Men's Full-Zip Jacket in several colors (Black pictured) for $8.74. Plus, coupon code "BGAC" bags free shipping. That's a total savings of $33. It's available in select sizes from S to XL. Note: Size XXL costs $11.24. Blair offers the John Blair Men's Long-Sleeve Polo Sweaterv in several colors (Stellar Blue pictured) for $9.99. Apply coupon code "BGAC" to bag free shipping. That's $30 off list and the lowest price we could find. It's available in sizes S to XL. 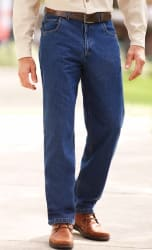 Blair offers the Scandia Woods Men's Relaxed Fit Jeans in several colors (Stonewash Denim pictured) with prices from $16.95. Coupon code "BGAC" bags free shipping. That's a savings of up to $25. They're available in sizes S to XL in waist sizes 30" to 48". 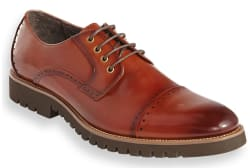 Blair offers the Stacy Adams Men's Leather Cap-Toe Shoes in several colors (Cognac pictured) for $35.95. Apply coupon code "BGAC" to bag free shipping. That's the lowest price we could find by at least $34. They're available in sizes 8 to 13. 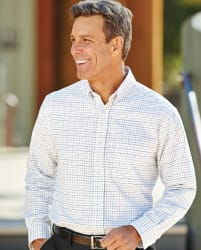 Blair offers the Irvine Park Men's Wrinkle-Resistant Long-Sleeve Oxford Shirt in several colors (Multi Tattersail pictured) for $11.97. Plus, coupon code "BGAC" bags free shipping. That's a combined savings of up to $33 and the best price we could find. It's available in select regular and tall sizes from 15.5 to 20.5. Blair offers the Irvine Park Men's Space-Dyed Panel Shirt in Blue or Nutmeg for $14.97. Plus, coupon code "BGAC" bags free shipping. That's a savings of $22 and the lowest price we could find. It's available in sizes S to 3XL. 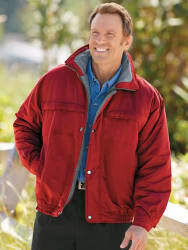 Blair offers the Scandia Woods Men's Insulated Microfiber Jacket in several colors (Brick pictured) for $29.99. Plus, coupon code "B3NYQ" scores free shipping. That's a savings of $40 and the lowest price we could find. It's available in most regular and tall sizes from S to XL. Deal ends January 17. Note: It's also available in regular and tall sizes XXL and 3XL for $36.99 with free shipping via the above coupon. That's a savings of $47 and also the best deal we could find. Blair offers the Scandia Woods Grid Fleece Jacket in Phantom or Teal for $17.49. Plus, coupon code "FBZQ" bags free shipping. That's a savings of $24 and the lowest price we could find. It's available at this price in sizes S to XL. Sizes XXL and 3XL are also available for $22.49 with free shipping via the same coupon ($32 savings).